Recognizing the importance of good governance as a fundamental part of discharging their responsibilities, the Board of Directors (“Board”) has taken steps to evaluate and implement the Group’s corporate governance policies and procedures. The Board is committed to ensure that good corporate governance is practised and complied with throughout the Group within the framework as expounded by the Malaysian Code on Corporate Governance (“MCCG”) to enhance shareholders’ value. This Corporate Governance Overview Statement sets out the manner in which the Group has applied each Practice as set out in the MCCG during the financial year. This Corporate Governance Overview Statement is supported with a Corporate Governance Report, based on a prescribed format as outlined in paragraph 15.25(2) of the Main Market Listing Requirements (“MMLR”) of Bursa Securities so as to map the application of Masteel’s corporate governance practices against the MCCG. The Corporate Governance Report is available on the Company’s website, www.masteel.com.my as well as via an announcement on the website of Bursa Malaysia Berhad. The Group acknowledges the pivotal role played by the Board in the stewardship of its directions and operations, and ultimately the enhancement of long-term shareholders’ value. To fulfill this role, the Board is responsible for the overall corporate governance of the Group, including its strategic direction, establishing goals for management and monitoring the achievement of these goals. The Board is guided by a Board Charter which sets out the duties and responsibilities of the Board. The Limit of Authority further detailed the authorization of expenditure within the Group. The Managing Director/Chief Executive Officer (“MD/CEO”) together with the Executive Directors, supported by the Management staff, are closely involved in the Company’s day-to-day operations and ensure that shareholders’ long-term interests are served. Through oversight, review and counsel, the Board establishes and promotes the Group’s business and organizational objectives, provides leadership to the Group, oversees business affairs and integrity, works with the Management to determine the Group’s mission and long-term strategy. Collectively, the Board brings a balance of skills and experience appropriate to the business owing to their diverse background in business, accounting, finance, political and commercial field. • Risk Management Committee (“RMC”). Each Committee operates its functions within their approved terms of reference by the Board which are periodically reviewed by the Board and the Board appoints the Chairman and members of each Committee. All Board Committees have written terms of reference which is approved by the Board. The respective Chairmen of the NC, RC, AC and RMC report to the Board accordingly subsequent to the respective Committee meetings. The ultimate responsibility for decision making lies with the Board. The Board Charter is reviewed periodically by the Board or at least once a year to ensure it complies with legislations and best practices, and remains relevant and effective in light of the Board’s objectives. In April 2018, the Board reviewed and approved the revisions to the Board Charter, which included the enhancement of the role of the Board, the Chairman and the Company Secretaries; additional role of the Independent Directors and Senior Independent Director and other amendments to ensure in line with the practices in the MCCG. The Board also reviewed and approved the revisions to the Code of Conduct in April 2018. A copy of the Board Charter and Code of Conduct is published in the Company’s website at www.masteel.com.my. The Directors allocate sufficient time and effort to carry out their responsibilities. It is also the Board’s policy for Directors to notify the Chairman of the Board before accepting any new directorships notwithstanding that the MMLR allow a Director to sit on the boards of up to five (5) listed issuers. 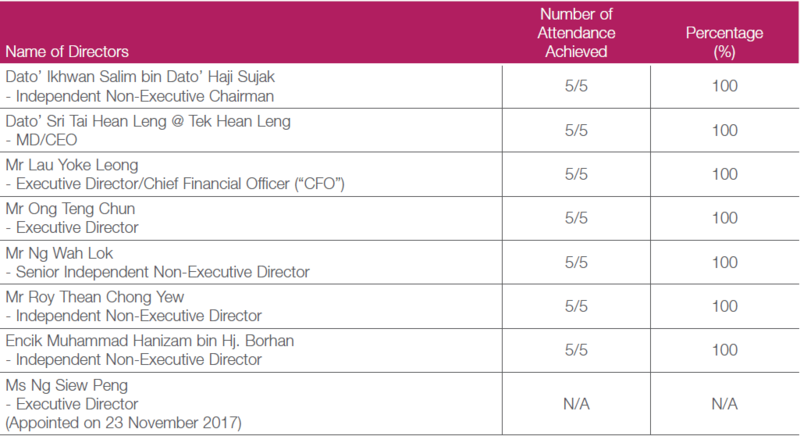 The Board is satisfied with the level of time commitment given by the Directors towards fulfilling the roles and responsibilities which is evidenced by the satisfactory attendance record of the Directors at Board meetings. The Company has also put in place various policies such as Corporate Disclosure Policy and Procedure, Succession Planning Policy, Whistle Blower Policy and Procedure, Risk Management Policy and Corporate Economic, Environment and Social Responsibility Policy and these policies are reviewed periodically by the Board. There is a clear division of responsibilities between the Chairman and MD/CEO to ensure that there is a balance of power and authority, as set out in the Board Charter. The Independent Non-Executive Chairman, Dato’ Ikhwan Salim bin Dato’ Haji Sujak is responsible for instilling good corporate governance practices, leadership and effectiveness of the Board while the MD/CEO, Dato’ Sri Tai Hean Leng @ Tek Hean Leng is entrusted by the Board on the daily running of the business and implementation of the Board’s policies and decisions. The Board has access to the advice and services of the Company Secretaries. Both Company Secretaries of the Company have legal qualifications, and are qualified to act as Company Secretaries under Section 235(2) of the Companies Act 2016 (“CA”). Both of them are Fellow members of the Malaysian Institute of Chartered Secretaries and Administrators (“MAICSA”). The Company Secretaries provide support to the Board in fulfilling its fiduciary duties and leadership role in shaping the Corporate Governance of the Group. Notices of meetings are circulated to Directors at least seven (7) days before the meetings. Management provides the Board with detailed meetings materials at least three (3) business days in advance. Senior Management may be invited to join the meetings to brief the Board and committees on requisite information being discussed, where necessary. leadership role in the conduct of the Board and its relations with shareholders and stakeholders. This composition satisfies the requirement of MCCG and the MMLR. The current size and composition of the Board is adequate for facilitating effective and objective decision making given the scope and nature of the Group’s business and operations. The Independent Directors play a strong and vital role in entrenching good governance practices in the affairs of the Group through their participations in the NC, RC, AC and RMC respectively. strength. During the year 2017, a female Executive Director was appointed to the Board as part of the Company’s initiative in achieving the gender diversity. The Board has also through its NC, conducted an annual assessment on the effectiveness of the Board as a whole and the contribution of each individual Director. The effectiveness of the Board Committees is assessed in terms of composition, required mix of skills, experience, structure and processes, accountabilities and responsibilities, as well as the effectiveness of the Chairmen of the respective Board Committees. During the financial year under review, the Board assessed the independence of its Independent Non-Executive Directors and found them to be independent and objective during Board’s deliberations. The Independent Non-Executive Directors of the Company had also devoted sufficient time and attention to the Group’s affairs. None of the Directors on the Board hold more than five (5) directorships in other listed issuers on Bursa Securities. composition and sufficient knowledge of related areas. Overall the quality of individual Director was considered strong and the Directors were found to possess the relevant qualifications, knowledge, experience and ability to understand the technical requirements, risk and management of the Company’s business. (h) Reviewed and recommended the appointment/promotion of Ms Ng Siew Peng as Executive Director of the Company. The Board through RC has established a Directors’ Remuneration Policy to assist the Group in attracting, retaining and motivating its Directors in order to run the Group successfully. During the financial year under review, the RC convened two (2) meetings which were attended by all the RC members. The RC had reviewed the remuneration for the Executive Directors, which reflects the level of risk and responsibility, the individual’s performance indicators (“KPI”) in the job, the performance of the Company and considered the packages are well within the comparable companies in similar industry. The RC had also reviewed the fees for Non-Executive Directors, which reflects the experience and level of responsibilities undertaken by the individual Non-Executive Director concerned. The level and structure of the Group’s remuneration policy are aligned with the business strategy and long-term objectives of the Group, as are appropriate to attract, retain and motivate Directors to provide good stewardship, as well as motivate key management personnel to successfully manage the Group. The Board is of the view that the current remuneration level suffices to attract, retain and motivate qualified Directors to serve on the Board. The detailed remuneration of the Board is disclosed in the Corporate Governance (“CG”) Report of the Company and in Note 22 to the financial statements. The Board is assisted by the AC to oversee the Group’s financial reporting processes and the quality of its financial reporting and to ensure that the financial statements of the Group comply with applicable financial reporting standards in Malaysia. The AC is chaired by an Independent Non-Executive Director who is distinct from the Chairman of the Board. All members of the AC are financially literate, with the Chairman and another member of the AC are also members of Malaysian Institute of Accountants. The AC comprises three (3) members all of whom are Independent Non-Executive Directors, with Mr Roy Thean Chong Yew as the AC Chairman. The composition of the AC, including its roles and responsibilities, number of meetings and attendance of AC, summary of AC activities and Internal Auditors’ activities during the financial year under review are set out on pages 39 to 41 under Audit Committee Report of this Annual Report. The AC regularly reviews and scrutinises the audit report by the Internal Auditors and conducts annual assessment on the adequacy of the Department’s scope of work and resources. The AC has in its terms of reference requires a former key audit partner to observe a cooling-off period of at least two (2) years before being appointed as a member of the AC. Alongside, the AC has the procedures to assess the suitability, objectivity and independence of the External Auditor (“EA”) which is contained in the EA Assessment Policy. All members of the AC undertake continuous professional development to keep themselves abreast with the relevant developments in accounting and auditing standards, practices and rules. The AC discussed on a summary of internal audit’s findings together with the Management’s responses to ensure that the Management undertakes the agreed remedial actions by the Internal Auditors. establishing a sound internal control framework to manage risks with the overall responsibility for overseeing the risk management activities of the Group and approving the appropriate risk management procedures and measurement methodologies across the Group. With the assistance of an external consultant, an Enterprise Risk Management (“ERM”) Approach has been adopted to develop an effective and sound ERM. The Board has established an internal audit function within the Group, which is independent of the operations of the respective operating units. The principal role of the department is to undertake independent regular and systematic reviews of the system and internal control so as to provide reasonable assurance that such system continue to operate satisfactorily and effectively. It is the responsibility of the Internal Audit Department (“IAD”) to provide the AC with independent and objective report on the state of internal control of the various operating units within the Group and the extent of compliance of the units with the Group’s established policies and procedures as well as relevant statutory requirements. The internal audit reports are presented together with the Management’s response and proposed action plans to the AC quarterly. The principles and guidelines promulgated by The Institute of Internal Auditors (“IIA”) in International Professional Practices Framework (“IPPF”) for an internal audit function to be considered effective has been adopted. The details of the Company’s risk management and internal control framework are set out in the Statement on Risk Management and Internal Control of this Annual Report. The Board recognizes the importance of maintaining transparency and accountability to its shareholders as a key element of good corporate governance and thus, maintains a high level of disclosure and communication with its shareholders through disclosure to Bursa Securities and to the press. The Board has put in place a Corporate Disclosure Policy and Procedure to ensure compliance with the disclosure requirements as stipulated in the MMLR and also to set out the persons authorised and responsible to approve and disclose material information to shareholders and stakeholders. The Company’s website, www.masteel.com.my is accessible by the shareholders, investors and members of the public to obtain information on the Company’s press releases, corporate information, operation activities and financial performance. The AGM is the principal forum for dialogue with shareholders. Shareholders are provided with an opportunity to participate in the question and answer session in which shareholders may raise questions pertaining to the business activities of the Company. The Directors are available to respond to questions from shareholders at the AGM. At the previous AGM of the Company held on 15 June 2017, all the Directors were present at the meeting to respond to the questions raised by the shareholders or proxies. The Chairman had notified the shareholders on the demand for a poll on all resolutions as set forth in the Agenda of the previous AGM for the interest of all shareholders and chaired the meeting in an orderly manner. Further, in line with the good corporate governance practice, the notice of the previous AGM was issued at least 28 days before the AGM date. 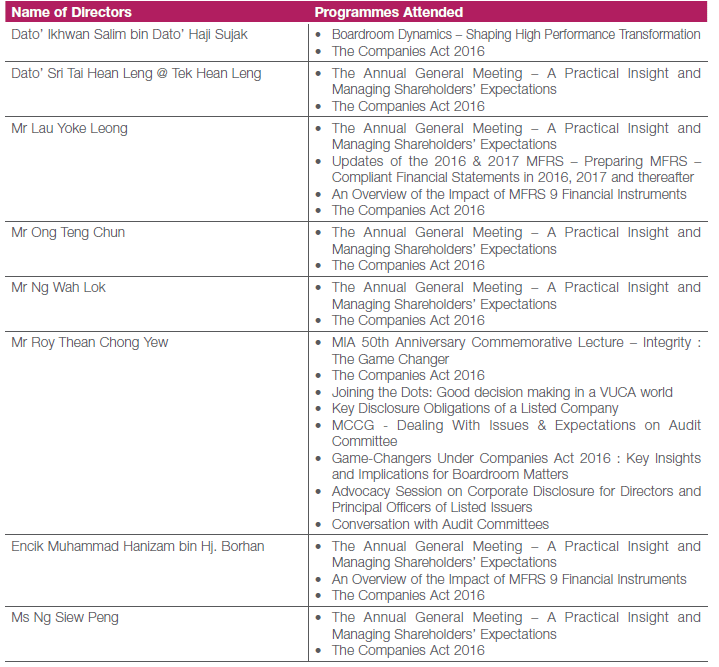 In addition to being dispatched individually to shareholders, the Notice of AGM is also circulated in a nationally circulated newspaper alongside an announcement on the website of Bursa Malaysia Berhad. This allows shareholders to have immediate access of the notice of AGM and make the necessary preparations for the AGM. The outcome of all resolutions proposed at the previous AGM was announced to Bursa Securities at the end of the meeting day while the Minutes of the previous AGM were published on the Company’s website as soon as practicable after the conclusion of the AGM. 2017 brought forth key regulatory changes within the domestic corporate governance realm. The Board, against a challenging business backdrop, focused its attention on the foundational aspects of its roles as they relate to the creation of long-term value for stakeholders. The Board recognizes and embraces the benefits of having gender diversity in the boardroom as a mix-gendered board would offer different viewpoints, ideas and market insights which enable better problem solving to gain competitive advantage in serving an increasingly diverse customer base than the boardroom that is dominated by one gender. In November 2017, the Board has welcomed its first female Director, Ms Ng Siew Peng. Her appointment is expected to pave the way for more women to join the Board in the future. The Board will focus its effort to establish a diverse Board with a variety of skills, experience, age, cultural background and gender. The Board undertook a review of its Board Charter alongside the Terms of Reference and Corporate Policies for each of the Board Committees early in year 2018. The documents were updated to provide guidance on governance and conduct of the Board, Board Committees and employees of the Company. The Board will review and update the existing policies and procedures as and when necessary to ensure that they are updated in accordance with the prevailing legal and regulatory promulgations as well as best practices. The Board, via the NC, assesses the training needs of each of its Directors on an ongoing basis, by determining areas that would best strengthen their contributions to the Board. All members of the Board have completed the Mandatory Accreditation Programme, prescribed by Bursa Securities as required by the MMLR. In addition, an orientation programme will be held for newly appointed Directors to enable them to familiarise themselves with the Group’s business and operation. The Senior Management had also briefed the Directors on general economic, industry and technical developments from time to time. The Directors will continue to attend relevant training courses to further enhance their skills and knowledge to enable them to discharge their responsibilities more effectively. The Company Secretaries facilitated the organisation of internal training programmes and keep Directors informed of relevant external training programmes. The Company Secretaries also circulate the relevant guidelines on statutory and regulatory requirements from time to time for the Board’s reference and brief the Board quarterly on these updates at Board meetings. The EA also briefed the Board members on any changes to the Malaysian Financial Reporting Standards (“MFRS”) that affect the Group’s financial statements during the year. to the shareholders for adoption of the new Constitution, for the purpose of streamlining the Constitution to be in line with the Companies Act 2016, the MMLR, the prevailing statutory and regulatory requirements as well as to update the existing Memorandum and Articles of Association of the Company, where relevant, to render consistency throughout in order to facilitate and further enhance administrative efficiency. This Statement is made in accordance with a resolution of the Board dated 4 April 2018.